Of all University theatres, the Melbourne Union Theatre has had the most profound influence on the development of an indigenous drama in Australia. Sir Raymond Priestly, the Vice-Chancellor of the University was responsible for the remodelling of the Theatre within the old and inadequate Victorian-Gothic Union House. 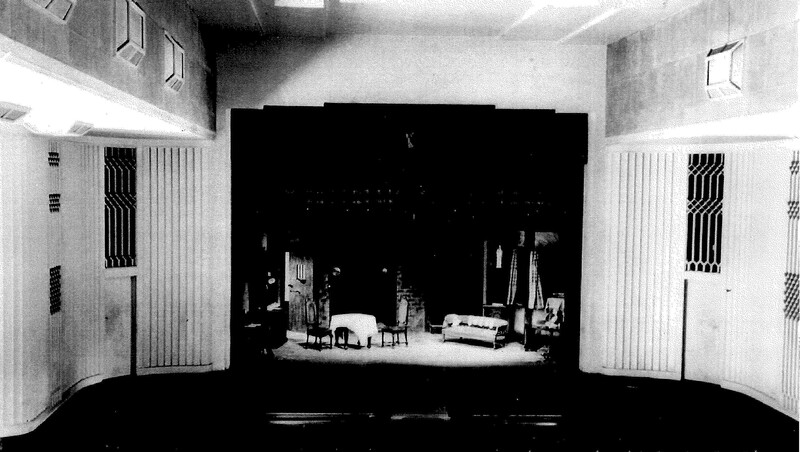 The Union Theatre in those days seated approximately 500 without raking the seating. There was little storage space back-stage and the lighting was limited. The seats in the auditorium were given to the Union by Australian Paper Manufacturers when the firm bought up the old Garrick Theatre near Prince’s Bridge. For the first seventeen years of its existence the Theatre operated under a manager appointed by the Union, as a home for University groups or visitors. One of the most vibrant times for University theatre was in the period immediately following Second World War. Returning servicemen completing their University degrees entered into the life of the University with enthusiasm and commitment. University societies, such as Marlowe Society, were established. The Marlowe Society built a fine record for University theatre presenting challenging productions on the campus. Their production of ‘The Tempest’ was seen as one of the-hallmarks of student theatre. D.D. O’Connor and Joy Youlden managed the Union Theatre in the late forties. The Union Theatre presented the first production of Douglas Stewart’s ‘Ned Kelly’. This production was directed by Dolia Ribosh, who was accredited with having worked at Moscow Arts Theatre. D.D. O’Connor was responsible for bringing the historic visit of Old Vic Company, headed by Laurence Olivier and Vivien Leigh to Australia. The visit of Old Vic Company had a great effect on the Australian theatre. There were movements to form a company that could operate in the same way as the Old Vic Company. The Federal Government, which at that time was a Labor Government, invited Tyrone Guthrie to the country to advise the government on setting up a National Theatre Company. Unfortunately an election took place at this time and the Labor Government was defeated. It would be another decade before the Commonwealth Government became actively involved in public funding of the Arts. It was at the request of George Paton, the Vice-Chancellor, that Tyrone Guthrie interviewed applicants for the job as Theatre Manager of the Union Theatre in 1952. One of the briefs for the manager’s position was the vague suggestion that the Theatre could be utilised in the periods that the University wasn’t using it for the theatrical presentations. John Sumner, who at that time was a stage director for H.M. Tennats in London was the successful applicant. Within a year of taking up his position, John Sumner launched the first professional repertory company in Australia with a company of six actors. The season of Union Theatre Repertory Company was from August to February. The Company resided at Union Theatre for thirteen seasons. The formation of the Union Theatre Repertory Company has been the most significant development in professional theatre in the country. The Company also has had an incalculable effect on Australian writing. Within three years of the formation of the Company Ray Lawler’s legendary play “Summer of the Seventeenth Doll” was presented at Union Theatre. During this period University theatre was also contributing to the bludgeoning theatrical scene. Barry Humphries was presenting his extraordinary revues; Ian Jones was appearing in “A Phoenix Too Frequent”. Actors who worked at Union Theatre during this period make up virtually a Who’s Who in Australian Theatre and also International Theatre. Some of the actors who worked with the Company in this period were Zoe Caldwell, George Fairfax, Noel Ferrier, Shiela Florence, Patricia Kennedy, Alex Scott, Malcolm Robertson, Frank Gatliff, Ray Lawler, Bill Bain, June Jago, Alan Hopgood, Frederick Parslow, Patricia Connelly, Neil Fitzpatrick, Richard Pratt, Paul Clarkson, Robin Ramsay, George Ogilvie, Monica Maughan, George Whaley, Lewis Fionder, Frank Thring, Reg Livermore, Elspeth Ballantyne, Patsy King. During Union Theatre Repertory’s occupancy of the Union Theatre, twelve Australian plays were performed by the Company. Playwrights who had their work premiered at Union Theatre during this period were Ray Lawler, Patrick White, Vance Palmer, Malcolm Robertson, Peter Batey and Reg Livermore. Since the Company left the Union Theatre in 1965 there has been only one presentation by the Company at Union Theatre. This was a production of Shakespeare’s “Twelfth Night” directed by Malcolm Robertson to inaugurate the renovations to Union Theatre in 1968. In 1968, Union Theatre Repertory Company became Melbourne Theatre Company. The years of occupancy at Union Theatre by this professional company did not spell the demise of student theatre. In fact the student theatre skill contributed strikingly to the artistic fabric of our society. University theatre centred around the Union Theatre developed such diverse talents such as Patrick McCaughey (director National Gallery), Graeme Blundell, James McCaughey, Peter Corrigan, David Kendall, Bill Garner, Sue Natress, Paul Eddey, Kerry Dwyer, Jonathan Dawson and John Duigan. The renaissance of Australian dramatic writing could also be claimed to have emanated from the campus axis of the Union Theatre in the late sixties. This movement which began with a production of “White With Wire Wheels” by Jack Hibberd at Melbourne University, was directly responsible for the success of the early productions at La Mama. Eventually this ferment was consolidated into the formation of Australian Performing Group at Pram Factory, Carlton. The role of Union Theatre, University of Melbourne, must assume in the annals of Australian theatre, a pre-eminence that would be difficult to be superseded by any other theatre in Australia. It has been a crucible for the development of the performing arts in this country. The Theatre has fulfilled the role that had been sought by the early visionaries such as Sir Raymond Priestly and Sir George Paton in influence and effect that they could have hardly envisaged. With such a fertile past, Union Theatre deserves to look forward to a future as equally as illustrious.